June is my birthday month. I love it that the rose and pearl are the flower and birthstone for June. My two favorites! Garden roses are the absolute best, but alas, I have none. So many bloggers have lovely gardens full of lush rose bushes; my knockout roses are the closest I get. I can't wait for them to bloom. We just spent a long weekend in North Carolina, and the knockout roses are in full bloom there, so it should be just a little while longer before they bloom here in Michigan. You can be sure I will have vases and bowls of them in my house throughout the summer. When we got home, I found a package waiting for me. 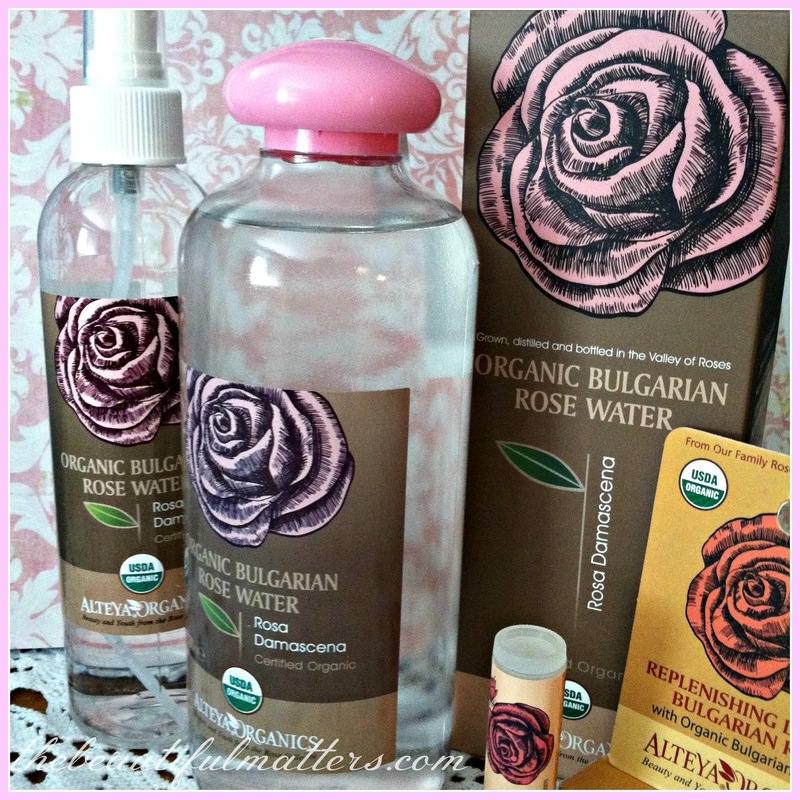 Organic Bulgarian rose water and lip balm. 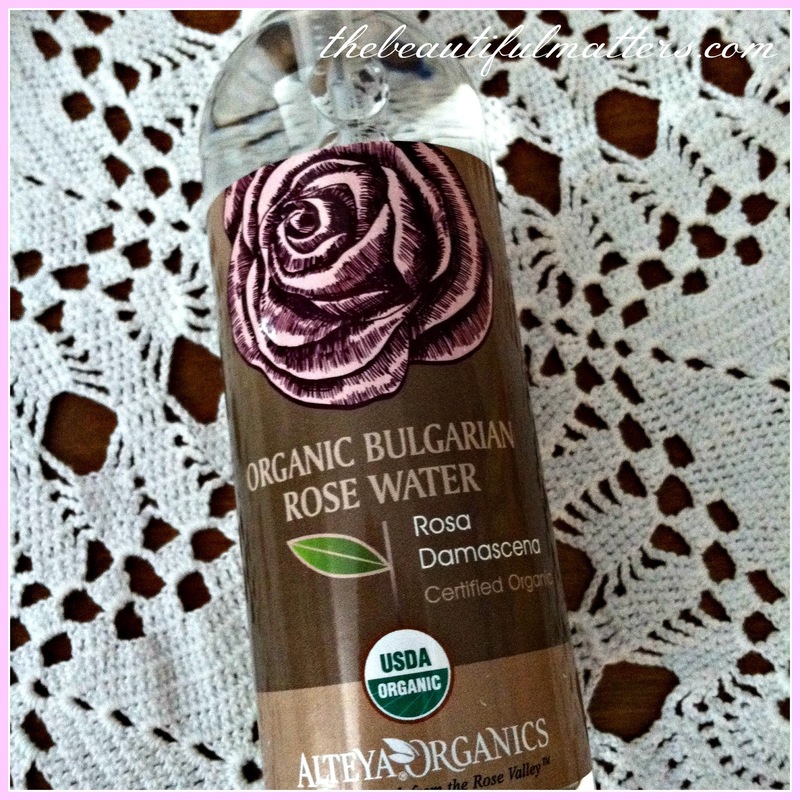 This is from Alteya Organics ("Beauty and Youth from the Rose Valley"), "bottled in the heart of the Valley of Roses in Bulgaria . . . steam distilled from fresh organic rose petals, from the fragrant Rosa Damascena flowers, handpicked in our rose plantations." Sigh. Doesn't that sound romantic? I'd love to live in a Valley of Roses, wouldn't you? I have used the toner and spritzer before, and they are lovely. Sometimes I've put the spray mist in the refrigerator in the summer months for a cool, refreshing spritz. You can even use the rose water for cooking, although I haven't tried that. The lip balm is lovely, too. 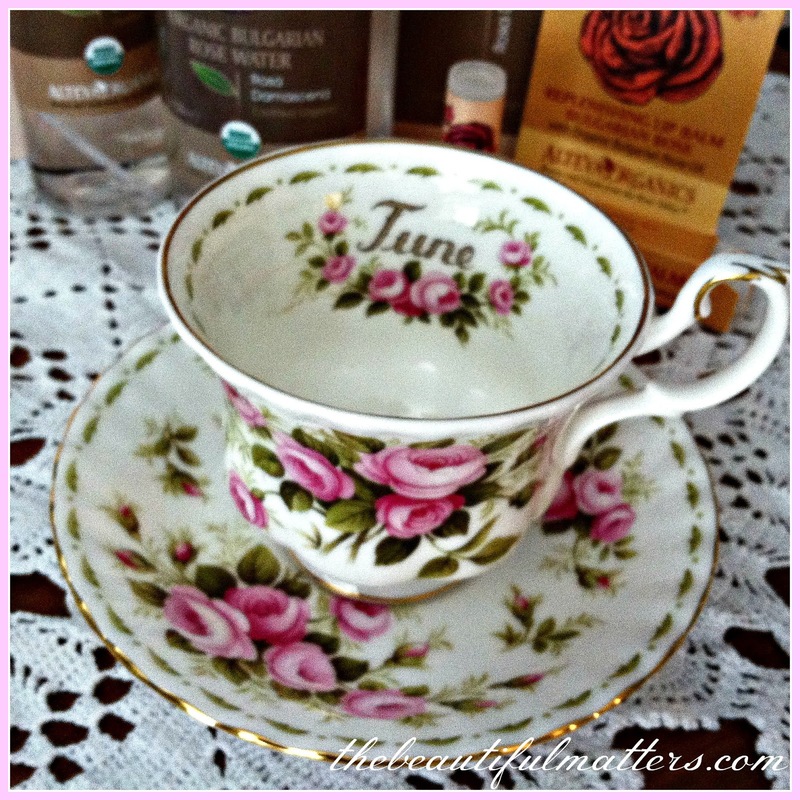 Here is my birthday month teacup from Royal Albert. And from the archives, more pearls and roses . 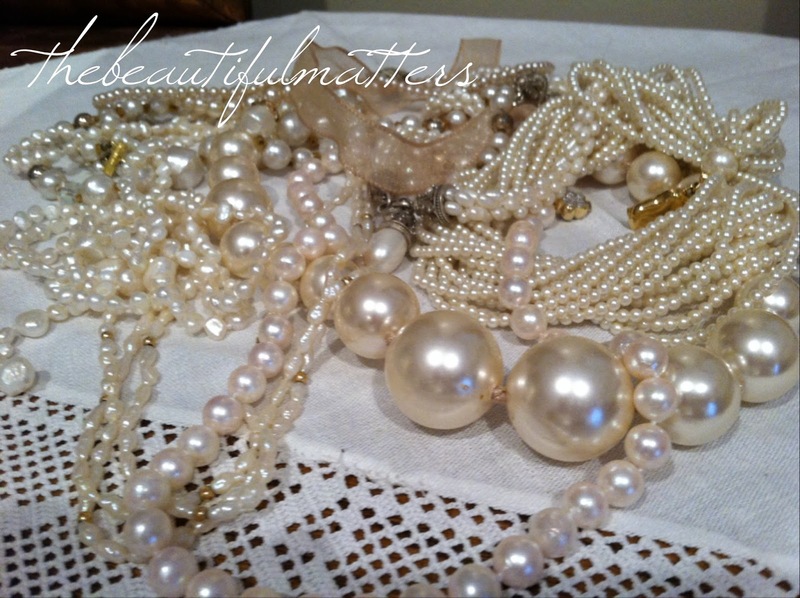 . .
Pearls have always been a symbol of refinement, elegance, and taste. The ancient Greeks believed that pearls were the hardened tears of joy that Aphrodite, the goddess of love, shook from her eyes as she was born from the sea. Arab legend held that pearls were formed when oysters were lured from the ocean by the moon and then swallowed moonlit dewdrops. Pearls have long been associated with the moon, and many people once held that they thus contained magical powers. Pearls have been ground up and used in cosmetics; some cultures believe pearls, crushed and taken internally with honey or wine, are an aphrodisiac and can cure many ailments. Cleopatra is said to have crushed a pearl, dissolved it in a glass of wine vinegar, and drank it just to impress Marc Anthony with her wealth. If you were born in June and don't favor pearls (what?! ), you can have your choice of two alternative birthstones, the moonstone or the alexandrite. The rose is also rich in history and meaning. It is at once both a symbol of purity and passion, virginity and fertility, death and life. In ancient Rome, roses were grown in funerary gardens to symbolize resurrection. Rose thorns represent suffering and sacrifice. Aphrodite, the Greek goddess of love, is associated with the rose as well as with the pearl. She is often depicted with roses around her head, feet, and neck. A rose bush was supposed to have grown within the pool of blood from her slain lover, Adonis. In Christian symbolism, a rose bush was said to have grown at the site of Christ's death, the blood associated with a red rose, the thorns symbolizing the ultimate sacrifice. Thus, the rose has come to symbolize an immortal love, a union that will never fade, even through time or death. 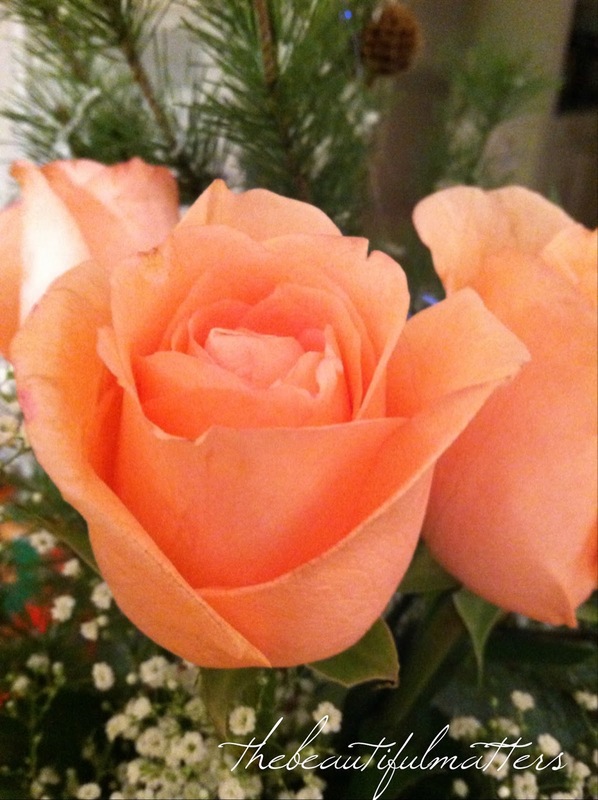 The rose has also been used as a symbol of secrecy. The term "sub rosa" (under the rose) calls for silence and discretion. Anything spoken under a rose hung from the ceiling at a meeting was to be kept secret. 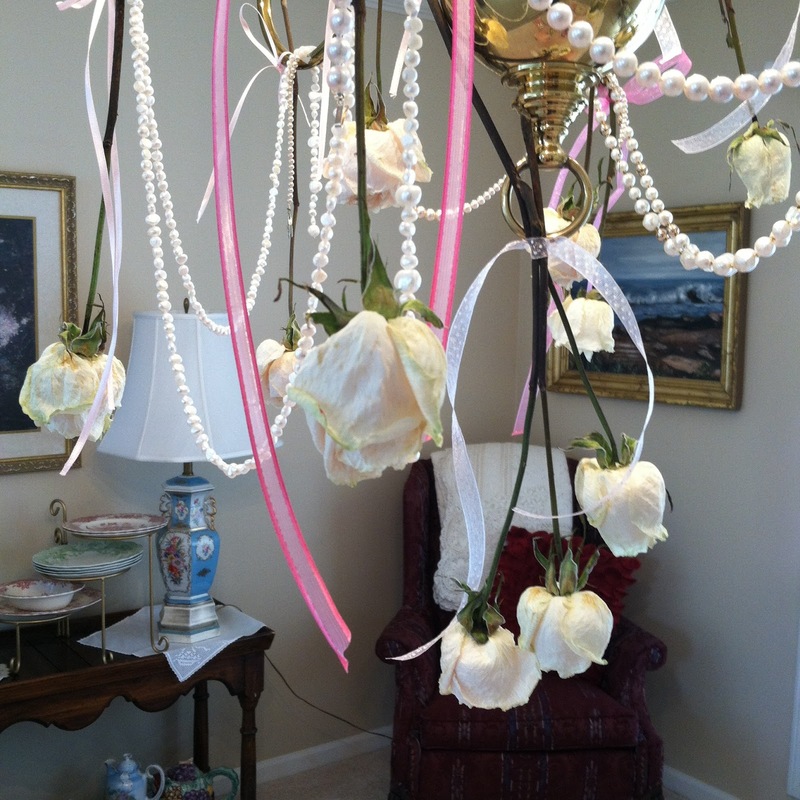 I didn't know that when I hung roses from my chandelier this past Valentine's Day! What a nice post. Happy Birthday to you this month. 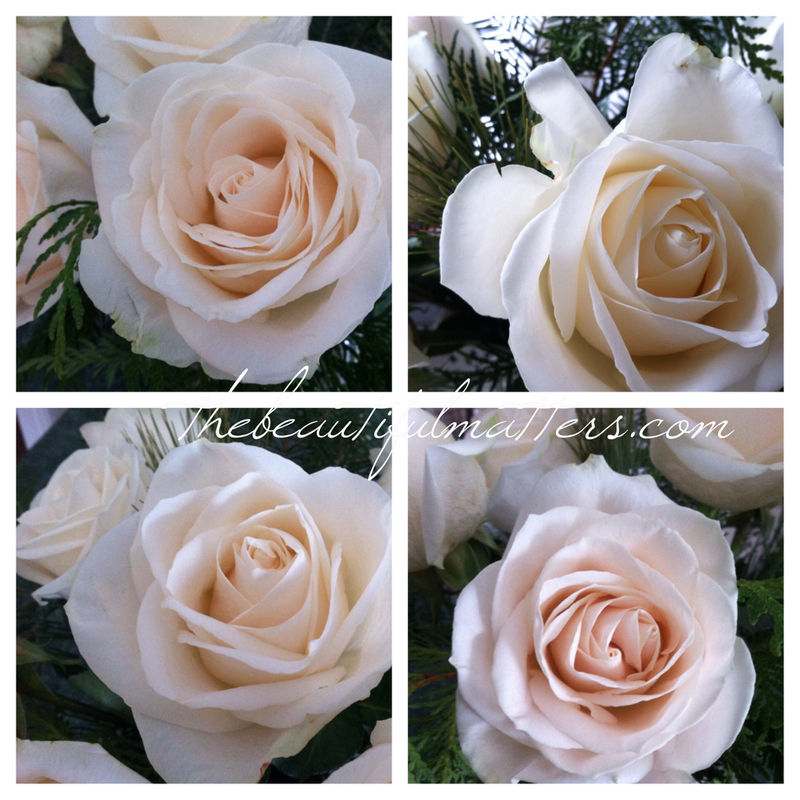 I love both roses and and pearls, so elegant! Have a wonderful week. Happy BIrthday, Deborah! I love this post, as my birthday is also in June (2nd). I love pearls and roses also. 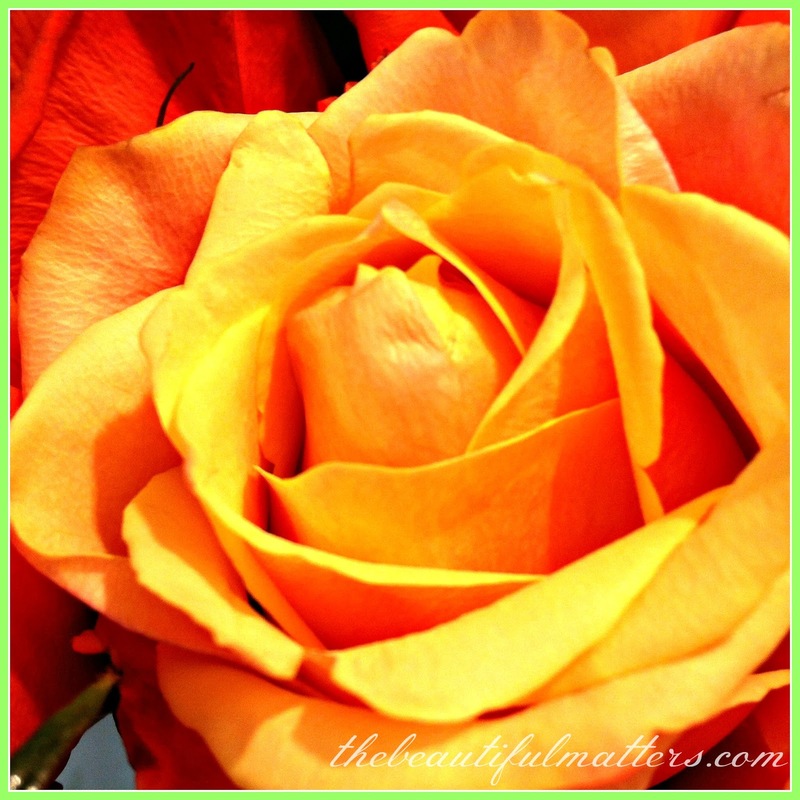 For the longest time I used to wear Ombre Rose, a wonderful fragrance. I coveted owning an alexandrite for years when, as a child, a friend's mother had purchased one in Mexico which I admired. It always enchanted me the way it turned from green to red in natural vs artificial light. As an adult, our jeweler informed us they were prohibitively expensive if they could even broker one due to their rarity; alas, I am content with my pearls and viewing the alexandrite in the Smithsonian museum. :) Both my girls wore my pearls in each's wedding. I love your background stories on Aphrodite and Cleopatra with the pearls, both trivia I did not know. On my birthday, my knockouts bloomed for me, but my present was an industrial shelving unit, so I can organize my tableware - a far cry from teacups and rose water, lol! Enjoy your birthday month! The valley of roses sounds like a fragrant area and one which I would love to reside. Two of my favourites pearls and roses! The rose cosmetics sound wonderful. I will have to check them out. I'm a July baby, but I love, love, love pearls and roses, too! I've always wanted some jewelry with both rubies and pearls combined. . . So enjoyed all the amazing facts and tidbits about your birthstone and birth flower, the pearl and the rose, respectively! Gotta give it to those ancient Greeks, (my brilliant ancestors! ), for their amazing creativity...Aphrodite's tears...priceless, indeed! Hope this month is as sweet and refreshing as that lovely rosewater! Let us know when the big day is! Lovely post and beautiful photos! I hope you have as lovely a day on your birthday. Happy birthday coming up, pretty lady and may God bless your new year of life and always! I love your flower and birth Stone too! I love your RAlbert month teacup. I also cherrish my Oct. one, as it belonged to my dearest Mil, she left it to me caz we were both Oct. girls! Thanks for your visit hon, you made my day! You have a delightful month in which to celebrate your birthday, many happy returns Deborah. Our oldest daughter's BD is next week and I used to decorate the house with peonies for her. The rose water products sound nice and you've given them a favourable review. I receive garden related products to trial because I am a garden writer but some of the other bloggers seem to get some really neat things offered to review. Depends on who is reading your posts I guess. My little guy is a June baby and I love his pearl birthstone. But I have my heart set on a mikimoto strand of black south sea pearls right now. I hope you have a very happy birthday month! 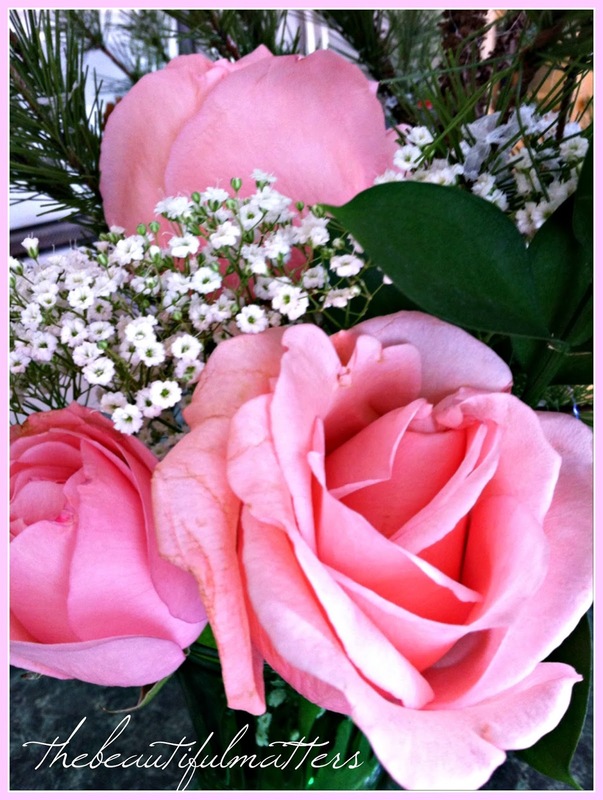 I love roses, pearls and alexandrites--but I was born in July! Bummer. I would love to have roses around my home too but we are totally ensconced in shade--not gonna happen. Plus, I would probably kill them off. Sigh. Lovely post and first off; congratulations with your birthday in June! Roses will grow here for careful gardeners and the plant will live for about four years. I believe in Europe and the Middle East they will survive for hundreds of years. A little rose oil will satisfy me. This is the heart of the pearl industry. South Sea pearls were harvested here by Japanese divers for many years. Now we have several pearl farms. Still very nice indeed. White ones. Imported freshwater pearls are sold in the local markets for those of us who like the look but can not afford salt water pearls. My mother would not wear pearls because of the saying 'pearls are for tears', but I feel differently. I actually enjoy the feel on my skin and the gleam. Something lovely that can be worn in the daytime. Yes, I wear my Cooking Pearls. Happy Birthday month, Deborah! What lovely gifts you received and so perfect for you, being the lovely romantic that you are. Blessings are sent to you across the miles. Wishing you a very happy birthday in June, Deborah! Pearls and roses are both beautiful and very you. I love the month of June also Deborah. It was also the birth month of my sweet mom, named June. Love the rose and pearls! Beautiful photos for a Happy Birthday to you! Mine is in July and I also adore the ruby and Larkspur. I have lots of Larkspur planted in my garden. Thanks for sharing with SYC.